ICCES have over twenty years of successful, growing business ranging from global broadband data and communication provisioning to technology solutions development. From a modest beginning, ICCES now operates its own communication hubs, data center, and Network Operating Center (NOC). Today, they provide global converged communications services and are positioned to meet future customer requirements regardless of location and scope. ICCES have capacities from SES-4 Ku Band satellite, in addition to the currently operating services and capacities from RSCC AM-44 Ku Band, Arabsat Badr 4 Ku Band all covering Europe and Middle East. SCPC/DVB-S2 available. We are operating on iDirect Infiniti and iDirect Evolution platforms, and Comtech Vipersat platforms. We are operating our own iDirect and Comtech HUBS with Globecomm Europe (M6) and supporting our clients with our NOC- qualified and experienced Engineers in 24 x 7 x 365 days. We are looking for sale partners and resellers in AFRICA, Egypt, ,Jordan, Lebanon, Iraq, Syria, Kenya, Oman, Qatar, Saudi Arabia, United Arab Emirates, Yemen, Iran, Bahrain and EUROPE. 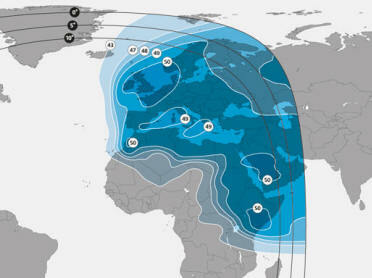 We are have capacities from the following satellites SES-4 KU BAND, BADR-4 KU BAND, AM-44 KU BAND. For these satellites or for other capacities, please inquire. For more details please go to the ICCES web site. Text and images on this page kindly provided by ICESS. Original posting: Africa Forum iDirect service This page is for information only and is not a paid-for advertisement.